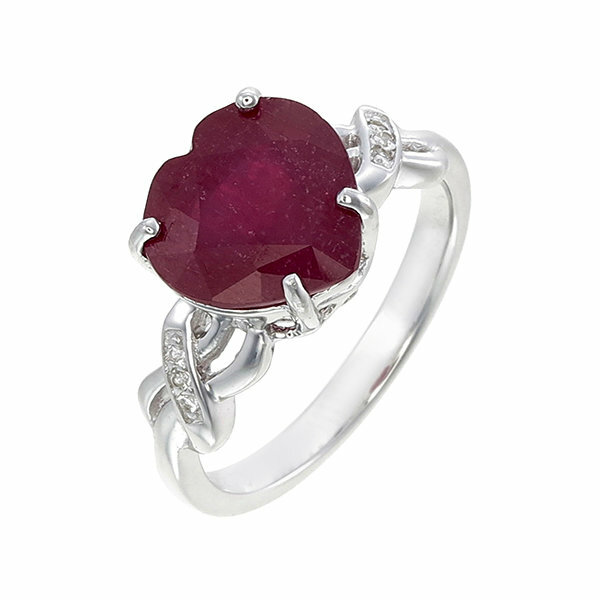 A stupendous sterling silver ring with a large ruby heart gemstone. The amazing thing is that, the gemstone is a natural ruby, heart shape 9-10mm. While heat treated rubies of this size and color could cost thousands of dollars, this silver heart ring features a natural ruby gem that has been treated using the fissure filling process. Rhodium plated (can request no plating). 9-10mm heart shaped natural ruby. The gemstone is fissure filled. White topaz for the side gems. Ring sizes available, 5 to 10 - half sizes available. Fissure Filled Ruby: More than 80% of the rubies that reach global gems and jewelry markets, are heated to improve their color and transparency. Rubies as you would know are very expensive and beyond most budgets. The gorgeous red beauty gets even more expensive as the gem size increases. As compared to the heat treatment process for rubies, fissure filling is a more recent development. The best thing about fissure filled rubies is that, they are a lot more affordable and require just a little more care to keep looking good for many years. We source rubies directly from miners and cutters, treatments and other details are clearly disclosed. To give you an idea of the price advantage that a fissure filled ruby brings, let us sketch a price comparison. A 9-10mm heart shape ruby that is conventionally heat treated, could cost as much as $4,000 to $8,000. Large rubies are not only more expensive, they are also much rarer than their smaller counterparts. Caring For Your Ring: So how can a fissure filled natural ruby silver ring be priced so attractively when, the same ring with a conventionally heated natural ruby gem, would cost thousands of dollars. The fact is that, natural rubies that are fissure filled need a little more care and attention. A small effort considering the gorgeous looks and amazing price tag that they wear. Keep the ring away from strong chemicals and detergents. Do not store the ring near heated environments. Cleaning the ring with a soft toothbrush and cool water is fine. Do not clean precious gemstone jewels in ultrasound cleaners. It is always advisable to keep jewelry away from physical impact. Ruby Customs And Folklore: This red gemstone is often referred to as the queen of the gemstone world. Its rarity and beauty explains why the price of ruby has always been high. The gemstone is well known as a symbol of love and affection, it was once considered to symbolize power and royalty. As a birthstone, ruby is listed as the birthstone for the month of July. The gemstone also marks the 15th and 40th wedding anniversary. Many people wear the gemstone to attract love and wealth, it is also believed to strengthen wisdom. Crystal healers recommend wearing a ruby when a person feels depressed or demotivated. Ordering And Pricing: Sizes available include 5 to 10 (US) and all half sizes. 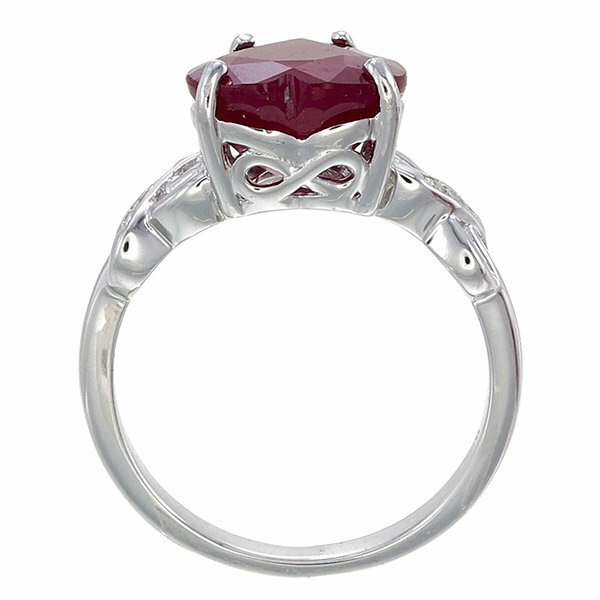 The sterling silver ruby ring shown above is priced at just 75 U.S$ + 25 U.S$ for shipping through FEDEX. Production is 2 to 3 weeks from the date of order confirmation and receipt of payment. You can make payment through Paypal or Western Union but, we recommend Paypal for first time buyers. Let us know which mode of payment you prefer and we will provide details for the same.